I decided to go on a solo backpacking trip to Dusy Basin last September because I felt I needed it. Let’s just say it was a busy, crazy year. I wanted to disconnect for a bit. I remembered back to two years prior, when the PD, SocalHiker, and I zoomed through Dusy Basin on the way to the first year of the Muir Taco tradition. Dusy Basin was a remarkable place. 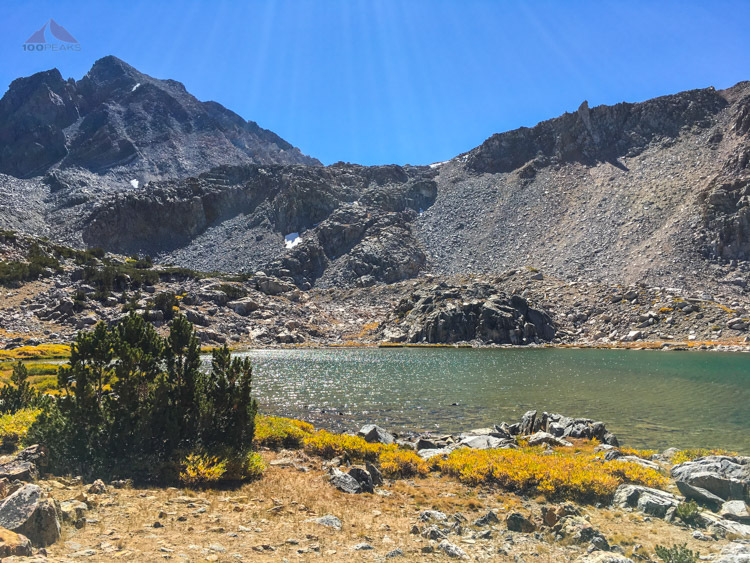 Mostly above the treeline, this basin sparkled with high lakes and a flowing river, flanked by an amphitheater of granite giants. 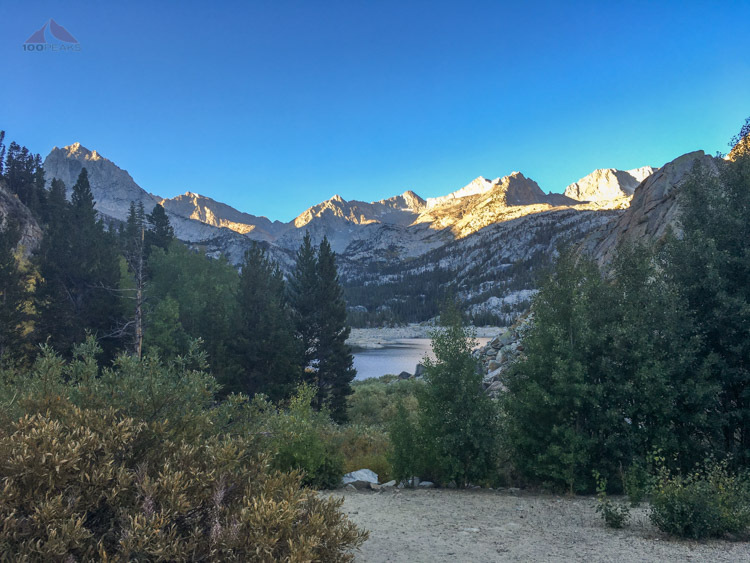 I planned for a solo trip: Drive up on the first day, pick up my permit, stay at a hiker’s cabin at Parcher’s Resort, head out early on the trail the next morning and make it to Dusy Basin, and improvise. A week before the trip, a friend mentioned that her husband was exiting the South Lake trailhead the same day I would be checking into a cabin nearby. Could we caravan? Sure! We met at a coffee shop and I followed her all the way to Lone Pine, where I picked up my permit. We also picked up some beer for her likely thirsty husband and his friend. They were already resting at the office of Parcher’s Resort when we arrived. Upon learning that they were going to look for a campsite for the night, I told them that was a silly thought, since I had a shower and three extra bunks in my cabin. Some great company was worth the tradeoff of losing some solo time. Over a campfire outside the cabin, we shared stories of outdoor adventures, and drank some beer. We all slept great in the cabin. We parted ways in the morning. They were on their way home, and I was on my way into the wilderness. I drove to the trailhead, passing some mule deer along the way. I was getting excited about this. I parked at the trailhead and noticed many other cars there. This was a popular way into the Sierra. It was a little late in the season, but it looked like a window of great weather. I would still need to keep an eye out for gathering clouds. I headed up on the trail, leaving the crazy world behind me. Normally there would be some chatting going on between gasps of breath as my body gets used to the idea of hiking at this elevation. But, this time, it was just me. And it was great. I decided to aim for Long Lake to have breakfast. I guessed it would be sunny and a glorious location to spend some time. I wasn’t wrong. Normally I power through the hiking day, stopping only when necessary. This time, I removed my pack, fired up my stove and enjoyed some hot coffee. Every since I tried some Starbucks Via coffee on the trail, I haven’t looked back. It’s very tasty. I look my time at Long Lake, perched on the same rocks from two years ago and enjoyed the cool morning in the sun. The stillness was complete except for the trickle of the outlet stream, the breeze through the trees, and the occasional trout coming to the surface of the lake. I was only about an hour from my car and I felt like I was in another world. On my own timeline, I repacked and headed up the trail along the basin, passing several beautiful lakes. I explored along the edge of Long Lake, remembering some campsite information that some backpackers told me two years ago as I came through. I found some excellent options and made a mental note for my way out. I passed some hikers here and there, but for the most part, I relished in my solitude. 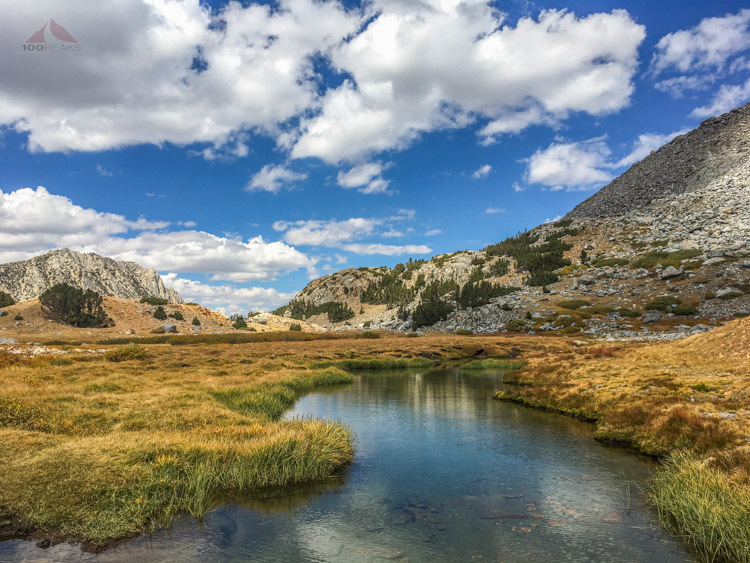 For the first time in my life, I was experiencing the Sierra as I do my day hikes, as a pure experience. A couple of hours later, I arrived at Bishop Lake. It was time for lunch. I perched on the rocks at the edge of the lakes and ate, watching the dark trout in the shallows. I saw some people with fishing poles and some tents in the trees, but still felt pretty secluded. Refreshed, I headed up Bishop Pass. I remembered there being water sources in Upper Dusy Basin, so I did not refill my water bottles before I started ascending. 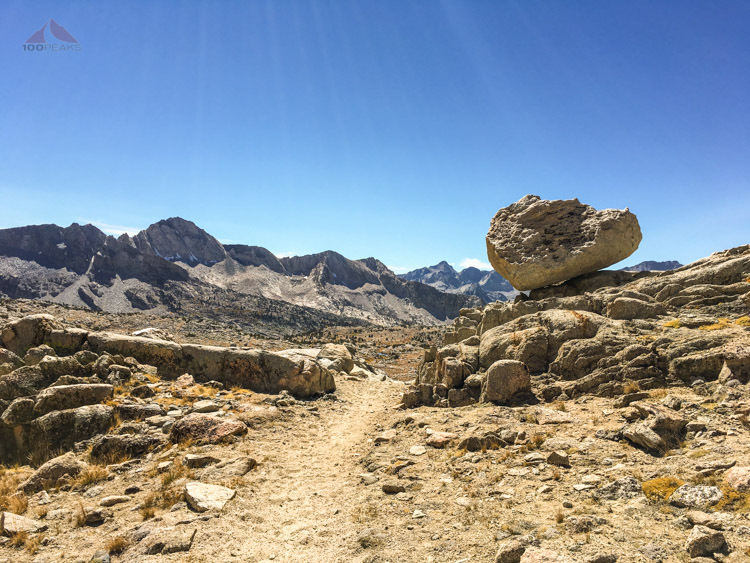 Sure, hiking up any pass can be challenging, but this time it was way easier. I wasn’t struggling to keep up with faster hikers and I didn’t have a cold or Morton’s Neuroma. I made it to the top in great time and was tempted to just keep on hiking. However, I saw another hiker taking a break, so I sat down and we chatted for a bit. He was waiting for the rest of his group and was enjoying the sun of the day. Done with our respective snacks, I wished him luck and started down the other side into Dusy Basin. I finally reached Lower Dusy Basin and encountered the string of lakes that I remembered fondly. I made my way to the other side of the lakes and found a nice spot. I was the only person around. I was a little tired from the day’s hike and sat in the shade for a while. I got out my water equipment and stood up to go down to the stream and refill my bottles. I was parched. Just then, I heard some grunts from the other side of the stream. I scanned the hillside and saw a black bear with its nose high in the air, grunting as it walked along. It entered the treeline and I could see it continue through a gap in the trees. It didn’t come out the other side. Wanting to avoid an encounter, I stood there and waited. I removed my sunglasses and continued to scan the hillside. Moving my gaze from the trees, to the hills behind it, to the path it would have taken had it kept going, I searched eagerly for the bear I did not want to surprise. 20 minutes passed and my thirst wasn’t going away anytime soon. I walked down to the stream and got my water. I never saw the bear again. I got settled in and had some dinner and some more coffee. I was a nice quiet spot, with a view of the giants of upper Dusy Basin, as well as a view southwest of the giants along LeConte Canyon. Since I was solo, there wasn’t much to do. I sat on a rock, still warm from the day, and just admired the view. There were no emails to check, no app notifications on my phone. Nothing to prevent me from looking skyward. I didn’t feel like I was missing out on anything that was happening in the “real” world. Rather, I felt that everyone else was missing out on this amazing sunset. Getting comfortable, I laid my ensolite pad onto a large flat rock and relaxed into the view before me. An orange and blue sky reflected off of the small lake before me. I felt the cooling evening around me and smelled the mountains. And I sat and enjoyed it, for several hours, occasionally wandering around the basin. After it got dark, I settled into the tent and went to sleep. I woke up to the dawn. I enjoyed the rising sun as I sipped coffee in the morning air. Since I didn’t pack much, I was ready to go in no time. I had plenty of water and plenty of time to make it back up Bishop Pass to find a spot to sleep on the other side. I made it to the top of the pass. Just as it happened two years ago, as I ascended out of Dusy Basin, the clouds started forming over the looming ridgelines and the temperature dropped a little. This time I was more ahead of the storm a little bit, but these clouds were moving pretty fast. I pointed a couple of Dutch trekkers toward Mount Agassiz, but warned them that a storm was on the way. They didn’t appear worried, but I did my part. I picked up some water by Bishop Lake, and headed to the snow researcher’s hut. I was looking for some shade and shelter from the cooling wind. Once again, I wanted to enjoy these moments on the trail. I leaned my back against the cool stone wall of the hut and made myself some coffee, watching a bird do acrobatics in the trees around me. Every time I make it to the outdoors, I find a slightly different way to enjoy it. This time, it was quiet moments while drinking hot coffee with nothing except the outdoors itself to distract me. Repacking my pack, I descended quickly, passing all of the gorgeous lakes I just saw yesterday, but it seemed like days ago. I made it to Long Lake and picked a perfect campsite on a ledge above the water. I debated with myself for a bit. I knew the rain would be coming, should I just hike it out to the car? I decided that I came all this way; I would stay the night, even if it rained. I pitched the tent and had dinner while the sprinkles started. Once the drops really started, I secured everything and got comfortable in the tent. Listening to the wonderful sound of rain on the tent and ground around me, I fell asleep at around 8PM. I woke up at 4AM, fully rested. The rain had endured for hours. I wasn’t sure when it stopped, but it hadn’t been for long. I looked up to the sky and saw stars. Peeking over the edge of the granite peaks around me were a new wave of clouds threatening to offer more precipitation. I made the quick decision to pack up and head out. Shaking off my wet tent, I swiftly stuffed everything back into my pack and headed down the trail wearing a headlamp. Calling out, “Hey bear!” I made my way in the dark, with the occasional moth dive-bombing my face. 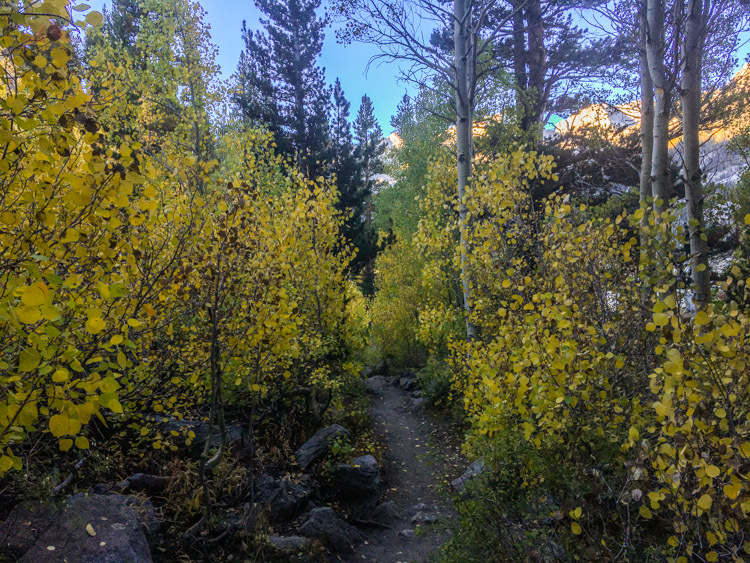 Everything looked different in the dark, but this was my fourth time on this trail in recent years, so I confidently made my way back to the car, just as the sun started to lighten the sky ahead of me and the sky darkened behind me. As I settled into the car, changing into sandals and a fresh shirt, rain drops started falling on the windshield. I made the right call. I drove back down into Owens Valley, reflecting on my time in Dusy Basin. When all the unnecessary parts are stripped away, time feels like a slow moving stream. I had been in the wilderness 48 hours, but it felt like a week. 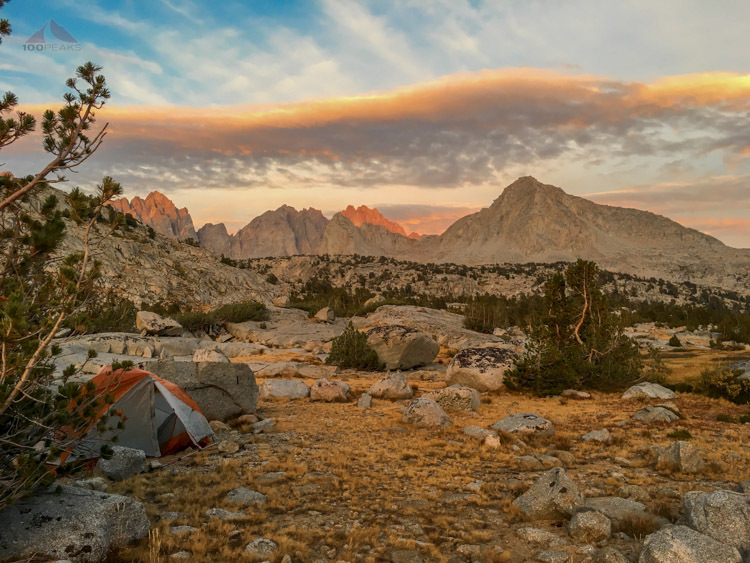 Over the next few months, when things got hectic, I found myself thinking of my time in Dusy Basin, where I rose out of my tent to a still morning on the edge of heaven.